This is a tale worth telling. A day of travel, a few firsts and marginal success, on the eleventh biggest body of freshwater in the world. and it's one I won't soon forget. It starts off with a text message from a good fishing friend who was back home for a few days from up north. He hoped I had a spare day to hit the ice, lucky for me, I was able to get a day off work with some banked hours. 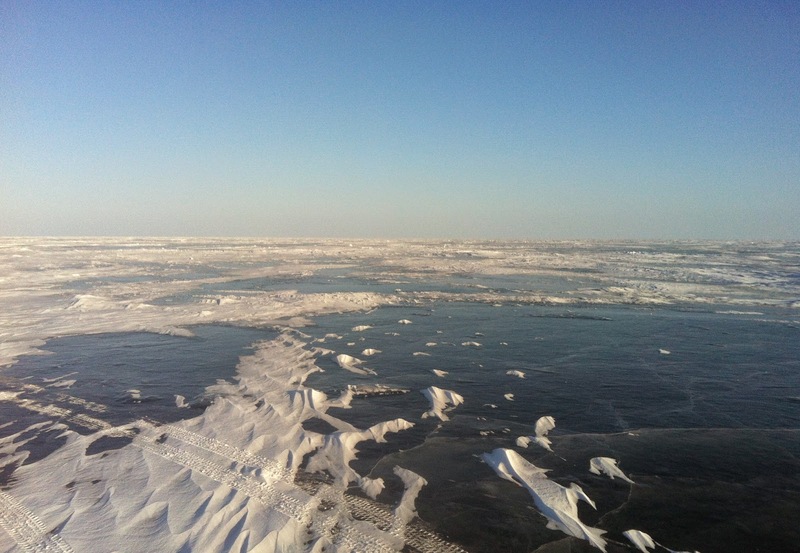 He wanted to go to the southern basin of Lake Winnipeg, I had never been before and was quite eager. Besides some cold temperatures, the weather and travel conditions appeared to be in our favour and the date and departure time was set. After crossing the second pressure ridge we were getting closer to the intended area where we wanted to start fishing. We noticed a truck stuck in a snow drift in the distance and we thought we should see if they needed help. We stopped near by to check if he could use a tug out and it was then that I realized my gloves, our bait and my fishing rods were left behind 250 kms back. My heart sunk, I've never done anything like that before. Tom was shocked as well explaining how he was excited for a trip where he didn't have to share any gear. Well that wasn't going to happen today. The stuck truck and its driver had help near by so off we went to drill some holes and set up shop. The ice was roughly 4 feet thick and we had 13 feet or so of water beneath it. The sun was just peeking over the horizon and the moon was on its way down. This was prime time for the walleye to feed and we were set up and fishing. The rod Tom could spare was a medium lite Fenwick with 4 lb line, not ideal for our intended target, but better than nothing. I tied on a PK spoon and tipped it with a minnow tail and got to jigging. In under ten minutes Tom had the first fish on, maybe three times the size of his minnow. The marks showing up on my Ice 55 flasher were fairly hesitant with a few aggressive ones in the mix, however most refrained from hitting my spoon. After a few lure changes and a couple missed bites I decided to set up a dead stick rod with Toms other spare. Seeing as how the bites and fish seemed slow and weary, I tied on a 1/4 ounce chartreuse northland tackle jig and tipped it with a minnow and sent it down below. Before I could get my transducer back in my jigging hole a school showed up on the screen and there were flickers everywhere, I couldn't see my jig at all. As I grabbed my line to pop it ever so slightly, I felt weight on it and ripped up and set the hook. After a short fight hand lining this fish with minimal runs, up came a nice sized walleye and Tom grabbed it out of the hole. It measured out at 25 inches and after a few pictures inside the shack (too cold for outside pics, fish eyes and fins freeze fast) it was released to fight another day. I love hand lining, and this was my first walleye retrieved in that method. As I released the fish and worked to reset my line it was clear the school had moved on, standard protocol would be to run and gun and try and stay on top of them. Weather and circumstances prevented this and we continued to fish in the warmth and comfort of our pop up shelter. It was time for another lure change on my jigging rod and the light line and rod made about a third of my tackle irrelevant so I decided to try out a gold Time Bomb. Within fifteen minutes or so I had a mark rip up off the bottom and slam my lure, it didn't feel huge but once iced it was a nice eater size and I wasn't complaining. It was my first time using the lure and the fish were reacting quite nicely to it. I eagerly dropped back down hoping to jig up a few more if the school was still near. This Time Bomb was the smallest size, I bought it with perch in mind. 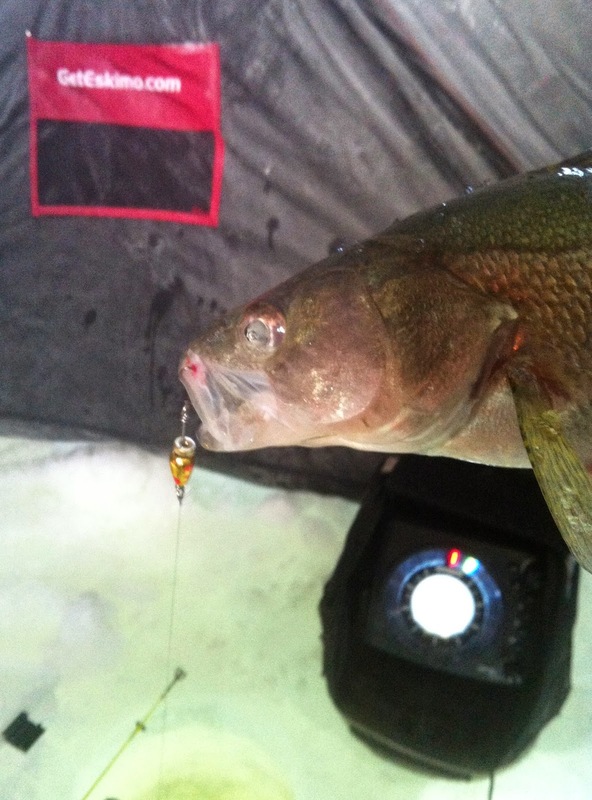 The treble hook is quite small and I actually ended up missing a few bites as well as losing a beast of a walleye on the bottom of the ice. I plan on adding a few more to the tackle box in all sizes and possibly trying to make some home made versions when time permits. After a lull in the action I was considering what to tie on next. Tom has what he considers tackle box ADD and changes up every 15 minutes or less, while I like to at least see how a fish reacts to the lure I am trying or have confidence in. I had set down my jigging rod after giving it 3 good rips and began to look through the tackle box. When I glanced up at my flasher screen I saw a huge red mark where my lure was. I grabbed the rod and lifted it up ever so slightly feeling weight below and drove the hook home. Right off the hop the fish went on a drag peeling run, the fluctuating temperature in the shelter made constantly checking your reels drag a must. Tom reeled up his lure and got my transducer out and dead stick reeled up. After gaining some headway on the fish it went off on another run, I was beginning to think this was a pike but something felt different. I could feel what I perceived were head shakes but with more fluidity as it would pull drag. Once near the hole Tom called out "It's a Pike or a Burbot!". When your ice hole goes four feet down through the ice sometimes it's hard to tell I guess. Standing at this point, my legs were quivering. 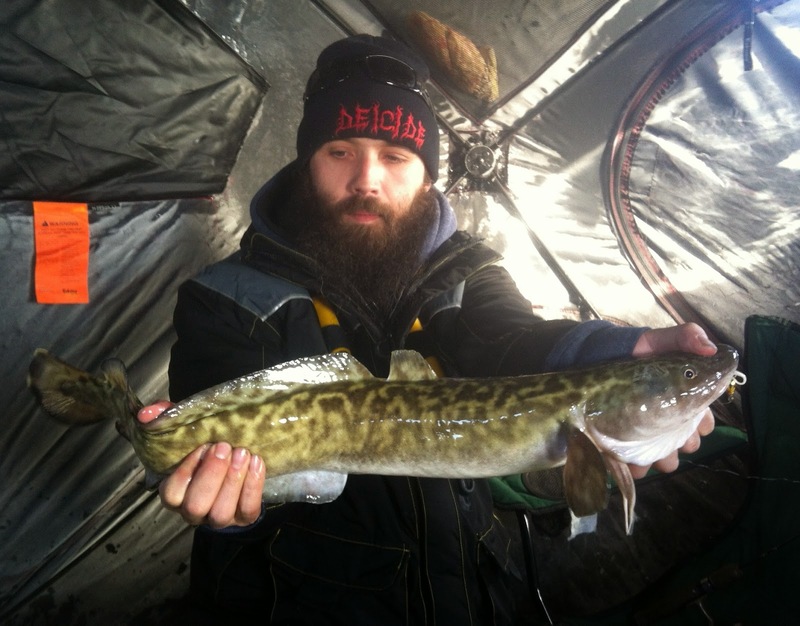 I had never caught a burbot before and was extremely excited and focussed. After the third run we had it coming up the whole only for the serpentine creature to do a figure eight and head back down. 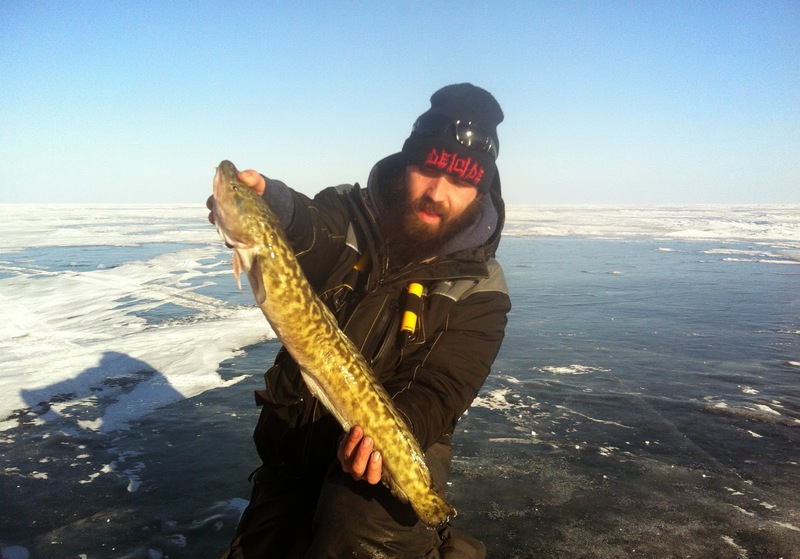 I really wanted to land this fish, it was turning out to be the best battle I had on the ice this season. After another tense run it was on it's way up and Tom reached in to the frigid water past his elbow and scooped it out. What a beautiful fish, it measured around 25 inches and was very strong wrapping around my thumb and hands as we tried to take some pictures. This fish was destined for the table, as I had always wanted to try "poor man's lobster", so a few pictures were taken with the beautiful scenery Lake Winnipeg has to offer. I plan on specifically targeting these camouflaged creatures for trophy and table fare as the fight is phenomenal along with the taste and texture. From this point on we were lucky to see a school or occasional mark about 3 times an hour, a fleet of snobears were out and about running and gunning, which provided something different to look at occasionally. The walleye didn't seem too interested in anything too aggressive and some of them could be played for five minutes before coaxing a bite or fading away. Around lunch Tom went running and gunning for 90 minutes with little success and I stayed behind experiencing the same. We agreed if we didnt get a good bite in 30 minutes we would leave, at the 29th minute a school came through. This played out with a few eaters iced and a pair of hogs lost, until we had to leave to make a deadline around 4 pm. The bite was just heating up and it was very tough to pack up, although I didn't have a choice. 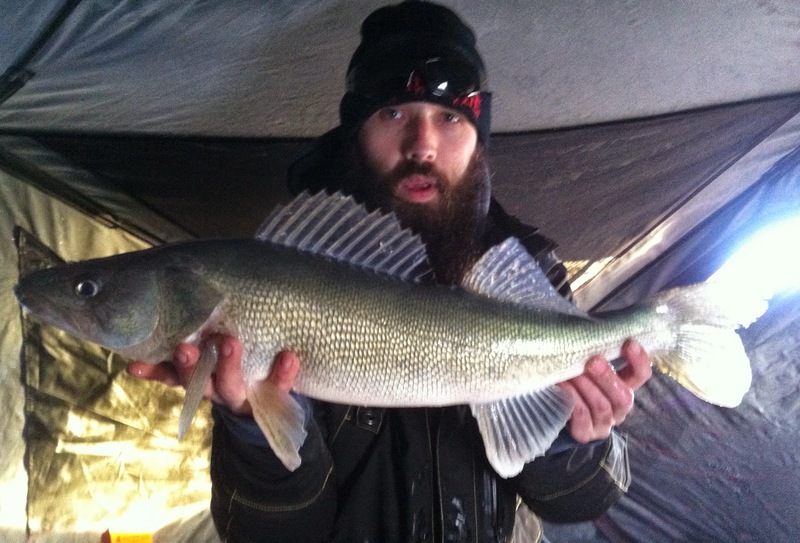 My first time ice fishing Lake Winnipeg was a success in my books, having my own rods along only would have made it more so. My game plan revolved around multiple rods rigged with different lures to be able to throw back down if a fish wasn't interested in my presentation. That all changed obviously and lacking a heavier back boned rod for more of a solid hook set was part of my downfall. Anyone with a bit of time and effort, reliable transportation and proper gear has a really good chance at a 28 inch plus trophy greenback the lake has become famous for. I am positive and ashamed we lost a few!